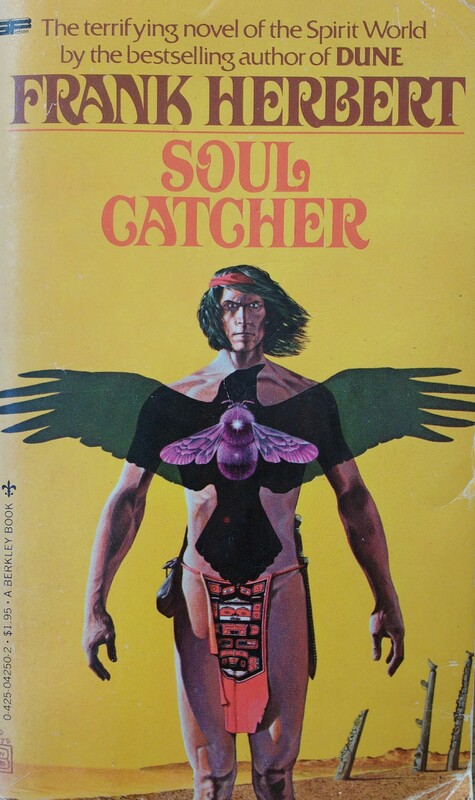 SOUL CATCHER – Frank Herbert (1972) | Weighing a pig doesn't fatten it. While Soul Catcher is dated in some respects, it still has something to offer to contemporary readers, most notably big emotions & a keen psychological understanding. The story has only two important characters, Charles Hobuket, the Native American Charles Bronson, and David Marshall, the kidnapped boy. Herbert switches viewpoints between the two, and manages to evoke empathy for both. Part of why the story works so well is the fact that David is only 13, and as such more prone to Stockholm syndrome, and more easily awed by Hobuket’s mythological delusions. The dynamic had not worked with two adults. Charles Hobuket has mental problems. Herbert doesn’t say so, but he is delusional. The fact that Hobuket – who renames himself Katsuk – manages to fit everything that happens in the story into his own narrative is a clear indication of his mental state. The fact that these mental problems in part stem from both traumatic loss and structural racism makes us sympathize with the character, who clearly is a victim too. Hobuket is not a typical villain, and writing a character like this – violent, delusional, hurt – is not an easy thing to do. I’m guessing this character would not be applauded today: a non-white character becoming a violent, mentally deranged militant, whose delusions are based on Native American mythology. One could argue that treating indigenous mythology as the source for psychotic behavior is not ‘respectful’. The other side of this argument is that events like this could very well happen in real life, and actually do happen. It struck me how much Herbert’s book was in sync with what psychologists have found to be the mental dynamic in some of present-day’s violent killers. In 2012 criminology professor Adam Lankford, author of the book The Myth of Martyrdom: What Really Drives Suicide Bombers, Rampage Shooters, and Other Self-Destructive Killers, wrote an insightful article in the NYT, What drives suicidal mass killers?. Charles Hobuket fits all 3 criteria his research showed: Hobuket has mental health problems; he has a deep sense of victimization, deeming an entire category of people responsible for his suffering; and he has the desire to acquire fame, staging his act for symbolic effect. “(…) I send another kind of message. I draw a design upon the emotions. My design will rise up inside people where they have no defenses. They will not be able to shut their ears and deny they heard me. I tell you, they will hear Katsuk! So, while Herbert has written a book that is difficult to reconcile with today’s sensitivities, the real world complexity and psychological intricacy he brought to the table are fully in sync with today’s scientific insights. In other words: this is indeed not speculative fiction, but a form of fictional realism. As recurring readers of this blog might know, a particular interest of mine is how the non-existence of free will is portrayed in fiction. Again both characters cannot escape their own path. David did not choose his predicament, and Charles did not either. Charles explicitly does not see himself as somebody who made a choice, but as somebody who was chosen. “Why was I chosen for this? (…) Out of what mysterious necessities did the spirit world act? What we end up with is an emotionally powerful book, with two characters that are both tragic, and both victims, and both have a flawed understanding of reality, but for very different reasons. Herbert seems to use Charles Hobuket as a mouthpiece for critique on a number of things. While it would be a mistake to think everything Hobuket says or writes corresponds 100% with Herbert’s own thinking, parallels with what I’ve read in his other novels make me believe Herbert at least wants us to ponder some of our society’s traits. I guess the following quotes speak for themselves, and do not need any further explanation. Obviously, some of these statements are generalizing, but that is the result of letting a character speak about ‘Western society’ as a whole, not of sloppy thinking by the author. Lucretius was a liar! Science doesn’t liberate man from the terror of the gods! The alien fabric sent a message to his nerves, telling of the mechanical giant the hoquat [= white men] called civilization. (…) In this land, Katsuk would have other powers, older and stronger and more enduring than those of the hoquat. And you destroy the earth to plunge your houses into it. (…) You are insensitives. You live against the earth, not with it. You do not support your fellows, yet complain of being unsupported. You scream for freedom while rationalizing your own self-imposed limitations. (…) Through all your fraudulent pretensions and roundabout self-trickery, you say you would risk anything to achieve equal happiness for all. But your words risk nothing. You are always running away from your bodies. You hide yourselves away in words of desperate self-justification. You employ the most despotic rhetoric to justify lives that do not fit you. They are lives, in fact, not lived. (…) You say love is futile and you pursue it. Finding love, you place no confidence in it. Thus, you try to love without confidence. It’s hard to say how much Herbert himself fell for the Romantic illusion of the noble savage, but statements like the one above do seem realistic for a character like Hobuket, whose self-justification needs a binary narrative of us vs. them, glorifying his indigenous past. I’d think Herbert himself is too smart to not understand that reality is more complex, humans being humans. Of particular interest is the question of ownership: who is entitled to a land, a region? Who came first? Territorial conflicts are older than the nascence of homo sapiens as a species, and as such claims to who belongs where are relative at best. Again Hobuket’s reasoning has a strong Romantic flavor – as if older cultures never depleted their lands or resources, or as if inter-tribal warfare was non-existent (both of which obviously are no excuse for the atrocities of white imperialism). You are the immigrant invader. You have not learned how to worship this land. It is my land because I worship it. The spirits know, but the land does not know it. Living in a state of respectful harmony with the land obviously is a worthy, even necessary goal, and the current state of environmental world politics is nothing to be at ease about. But especially in the premodern age, living in harmony with the land seems to me to be a question of a particular society’s scale, and thus success (in the sense of numbers) – not innate nobleness. Seele usually gets trans-literated into “soul,” but its meaning is more central, as in “depths of the soul.” Steele has much more to do with the unconscious, emotional identity. My question about Herbert had to do with whether you thought he kept those two concepts separate in his fiction or not. They are definitely conflated in a lot of popular culture (…). Before I get to Soul Catcher, a few quick remarks. Dutch is in my mother tongue, and a language even more closely related to German as English is. In Dutch we also distinguish between ‘geest’ and ‘ziel’, but likewise there is some overlap in usage, as I believe there is in German too: the word ‘Geist’ especially has numerous meanings: referring to both ‘mind/intellect’ and ‘spirit’. I have the feeling Herbert does separate both concepts, but not necessarily in the German, let alone Nietzschean way. The distinction he uses seem to originate from Native American mythology, which Herbert apparently studied with great care in preparation for this book. Hobuket/Katsuk does distinguish between two concepts. He uses the word ‘spirit’ in the sense of ‘ancient nature power’, as in spirit of the land, of the water, the bees. These spirits are partly animistic, but at the same time manifest as conscious actors too, and as such they could be considered “mental states of being”. Spirits can also inhabit a human body. You could call these ‘Geists’ – but I’m not well versed enough in Nietzsche to say anything about how he uses this term. The “Soul Catcher” of the title is the name of a spirit that inhabits the mind of Hobuket, transforming him in Katsuk, more or less. On the other hand Hobuket/Katsuk talks a few times about ‘souls’, meaning something that is fairly close to ‘Seele’ as far as I can tell. His native soul had rotted while living in that white world. But a spirit had spoken to him. A true and ancient spirit. He had spirit in him. Hoquat [= David] was not a whiner. He was not a coward. This had become a contest on two levels – the straightforward capture of a victim and the victim’s desire to escape, but beneath that a wrestling of spirits. I’ve carefully considered each and every passage in which the word ‘soul’ or ‘spirit’ or a variation appears, and again checked all those passages after I’d finished the book, and the above is the about all I can contribute to the question at hand. I’ll try to follow up when I (re)read more of Herbert’s work. Just a short remark for the Dune fanatic. The following quote clearly re-uses a concept familiar to those familiar with the series. I have no idea whether this concept really has grounds in Native American mythology too, or if this is just a wink of Herbert to his Dune readers. If you have any ideas about it, do not hesitate to post a comment. For what it’s worth, this particular quote is also the only time the idea occurs in Soul Catcher. He held up the arrow and the arrow held him. He led a cortege up the wood path from the most ancient times to the present. His mind was drunk with all the lives it held. A spirit shouted in his mind: “The earth does not know who owns it!”. Wikipedia informs us that the movie rights for Soul Catcher have been acquired only in 2014. For the same reasons I think a book like this would not find a publisher today, I doubt it this movie will ever see completion. Ironically, Villard admits that for the movie to get made, Herbert’s original ending needs to change. The story would not remain as powerful however, and might even lose its soul, so to say. When Villard says “not cinematically acceptable” he actually means “not culturally acceptable”, as it has nothing to do with the laws of movie making, but all the more with society’s sensitivities. Also Native Americans have voiced their objections to Soul Catcher‘s ending. It seems to me that was exactly Herbert premise: Charles Hobuket’s most important characteristic is his mental health problems, not his Native American descent. Herbert’s ending is brilliant, both on a dramatic as an emotional level, and it is a powerful indictment of our culture that drives people to madness. To change it would be a travesty – like so many other things the Frank Herbert estate has produced. There aren’t a lot of books that manage to pack so much intricate issues in what’s on the surface an easy story – a straightforward thriller – and at the same time manage to evoke heartfelt emotions. On top of that, all that in just 246 pages. It’s not perfect, it shows its age, but all things considered, it is superb. PS – Coincidentally the 4 non-Dune books I’ve read so far have been published as an omnibus in 1984, under the title Four Complete Novels. I guess my initial selection of which novels to read coincided with what the publisher thought to be his best non-Dune material. These 4 books differ widely, and as such provide a broad look on Herbert as an author off Arrakis. It’s no secret his best work is the Dune series, and most other books are not worth bothering if you’re not a diehard fan, so I’m not sure if I’ll read any more of his other books after Destination: Void. This entry was posted in Reviews and tagged 1970s, Colonization, Four Complete Novels, Frank Herbert, Non-SFF fiction, Review, Soul Catcher, Thriller. Bookmark the permalink. What really struck me about this novel is the way Herbert explores innocence. It has been a while since I read them but he had something to say on than in the Dune books as well. I always felt it doesn’t quite overlap with this novel. Although I guess it doesn’t get you out of a horrible situation in either case. There are actually two versions of Destination:Void. Herbert rewrote it before the release of the first of his collaborations with Bill Ransom, which are set in the same universe. I read the rewritten version and found it was pretty badly dated. Yes, David’s childlike innocence is really important for the story, and in a way Charles’ mental state makes him an ‘innocent’ as well. I don’t remember Dune tackling it, but I will keep it in mind when I reread, seems like a good angle, thanks. I wasn’t aware of D:V’s two versions. I have no idea which version I ordered, it should drop in my mailbox soon. Destination: Void is one of my favourite of Herbert’s books. However I did read it during the late 90s (my early 20s), so may not be so praise heavy today if I re-read it. In it’s original shorter version I found a tightly wound novel about consciousness, and basically, nothing else. But that’s kind of what I liked about it – it was a thought experiment through fiction. And as a writer myself, it showed that it was okay to write this type of novel, that something like this is perfectly viable. It’ll probably not be for a couple of months I’ll read it, I try to keep some distance between books of the same author. This is a fascinating review, and I really appreciate your kind words and following up on the Nietzsche spirit/soul question. I think what you’ve shown is that Herbert definitely was handling this matter within his fiction. One thing that occurred to me after the whole Children of Dune discussion was the idea that Herbert’s philosophical views may have been evolving during his writing career. Or, he could have presented different ideologies to fit the story (i.e., Herbert isn’t a philosopher in the traditional academic sense as much as he is a deeply philosophical novelist). In Soul Catcher, it appears that the Hobuket/Katsuk understands there are two entities, even if the quotations appear to use “spirit” and “soul” in an overlapping fashion. If that’s indicative of Herbert’s philosophy, then I’d have to conclude that he intentionally departs from Nietzsche (as he did in the Dune series about the existence of evil). If, as might be discovered by poring over his other works, that this is but one of several ways he writes about spirit and soul, then he’s attacking the problem from the angle of different cultures. Either way, I’m convinced that having these types of questions in mind, especially early in the story, is the right way to go about reading Herbert! While my fleeting attempts at reading other Herbert novels besides “Dune” have ended in failure, this one does appeal to me: partly because it’s in a different genre/classification and might not create the same expectations I had with other SF stories, and partly because the core subject(s) sounds very intriguing. Thanks for sharing! I read Soul Catcher in the late 70s. I was thinking about it today in conjunction with the Catholic Scandal happening now, and the movie ‘Calvary’. But can someone please remind me how the book ended? I remember how I ‘feel’ it ended. But I am not sure. Please someone, email me if you do not want to spoil it publicly. The main character kills the boy in the ritual sacrifice he intended to perform from the onset of the story.